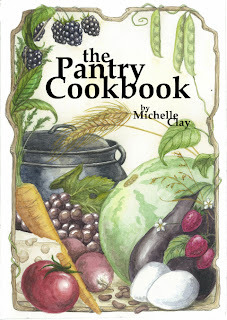 The Pantry Cookbook: Cookbook Cover! 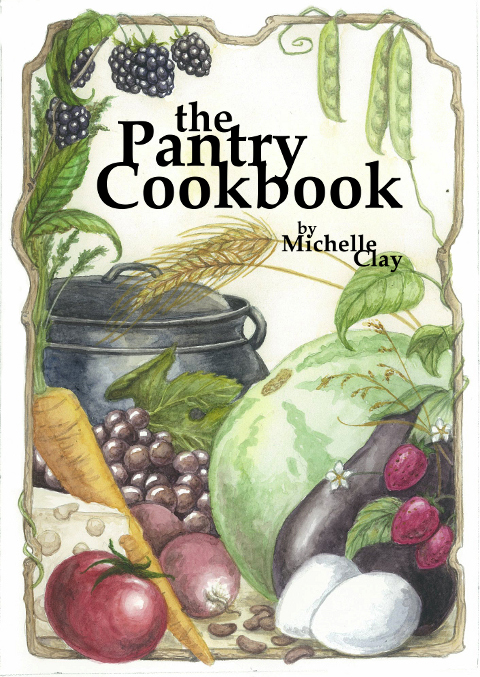 We have our cover! Many thanks to Martinique Fisher for her lush, delicious painting. I have had friends ask me why I wasn't illustrating the cover myself. Two answers: I don't have time! And, even if the circumstances were perfect, I doubt I could do justice to a picture of food. I know my limits as an illustrator. But, ahem, I'm too clueless about graphic design to know my limits, so the real GD-ers out there can have a laugh at my novice attempt to do something psudo-professional with text. I used to have fun mangling Palatino for fliers back in my college days, and it was a treat to fiddle with it again. I'll be tweaking the cover layout some more before the final version goes to the publisher, no doubt.